For this episode of the Salesforce Admins Podcast, we’ve got the first of a series of podcasts from Down Under, featuring folks Gillian met at the Salesforce World Tour in Sydney, Australia. This week, we’re talking to Vickie Jeffery, Business Technology Manager at Ausure Insurance Brokers, to hear about her career journey, how she’s grown into a strategic leadership role, and how Salesforce fits into that. 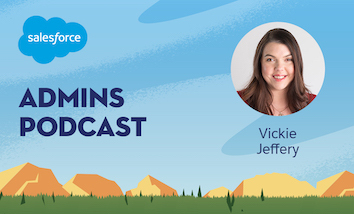 Join us as we talk about how learning programming at a young age gave Vickie the foundation to build a technical career, how she had to learn Salesforce on the job, and how she forged a path to leadership by being clear about what she wanted. You should subscribe for the full episode, but here are a few takeaways from our conversation with Vickie Jeffery. Why inheriting Salesforce helped Vickie transform her company. “I actually wanted to be an architect. I loved drawing plans of houses and all that kind of thing until my dad bought a computer when I was about ten, and then things changed,” Vickie says. He taught her how to write programs in BASIC and she just couldn’t stop making things. When she got into the professional reward about twenty-four years ago, she started as a network admin and eventually moved into IT management. That took her from New Zealand to Australia. “We had an acquisition in about 2011, and that company was using Salesforce. So since then, it’s been a part of my life and my work,” Vickie says. Since she inherited it, she needed to review the implementation and find ways to put it to work for her organization. “I knew that it was a CRM and what we should be doing, but when I reviewed it all they had really done was put some contact information in it, which I thought was quite an expensive contact card,” she says. As she kept working with the platform, she found ways that Salesforce could actually help the merger and, ultimately, help them manage the information they deal with as an insurance broker. Nowadays, Vickie is the Business Technology Manager. She’s in charge of an IT team and is also involved in strategy, systems processes, and more. “I like to have an overall big picture of the company,” she says, “it’s really about getting down and understanding what everyone does and trying to streamline it and automate it and help people with their everyday jobs.” It’s a lot of what we talk about when we talk about “admin magic”, accurately understanding business problems, finding the technology that can help, and then teaching people how they can best put it to use. Vickie has people on her team who help her with that so she can use her architect brain to look at the big picture. So what makes the admins who work on Vickie’s team stand out? It’s a combination of good communication skills and good analytical skills. “Being able to listen as well as talk,” she says, combined with an ability to look at requirements and translate that into what’s possible in a system. How do you step into a leadership role? If you’re looking to grow your career and step into a leadership role, one of the biggest pieces of advice that Vickie has is to start speaking up. “I made it quite clear that I was really interested in strategy and wanted to be involved, and so I kept on asking,” she says. She would just keep mentioning it and coming up with ideas for what could work better at her organization, so when there were opportunities she was top of mind. The other important thing for trying to step into leadership is to be continually learning. “Along with all of the Salesforce learning, I’ve been continually learning about people management and business processes and everything that I can,” Vickie says. Not surprising for someone who learned BASIC when they were ten. Vickie is the co-leader of the Brisbane User Group and a big advocate of connecting with everyone in the ecosystem to keep learning and growing. They run an event in Brisbane, where she lives, called Down Under Dreaming. “Bringing all of that together into one day for our people in Brisbane who may not be able to get to World Tour or Dreamforce is really important to us,” she says. 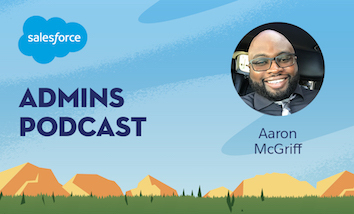 Gillian Bruce: Welcome to the Salesforce Admin’s Podcast where we talk about products, community, and careers to help you become a more awesome Salesforce admin. Gillian Bruce: I’m Gillian Bruce. 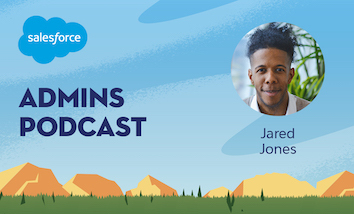 Today we’ve got the first of a short series of podcasts I was able to record while I was down under in Sydney, Australia for the Salesforce World Tour which happened just a little while ago. I got the opportunity to sit down with a few local Salesforce community members in the Sydney area to chat about their stories, about what it means to be an awesome admin, and just to learn a little bit more about what they do and how they do it. Gillian Bruce: The first story we’re going to share with you today is that of Vickie Jeffery. She is a business technology manager at Assure Insurance Brokers and she is actually from Brisbane, Australia, so not from Sydney, but that’s not too far away, just a short flight. 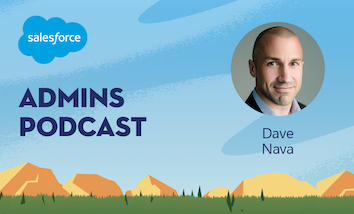 I wanted to get her on the podcast to share a little bit about her career journey, how she’s grown into a strategic leadership role, and her journey with Salesforce. Without further adieu, let’s welcome Vickie to the podcast. Gillian Bruce: Vickie, welcome to the podcast. Gillian Bruce: So happy that you are taking the time to join us. We are here in Sydney, but you had to travel down to Sydney, right? Vickie Jeffery: Yeah, I did, from Brisbane. Gillian Bruce: Brisbane, okay not far. Gillian Bruce: Well I’m really happy to have you on the podcast because I want to dig a little bit into your story so we can share with our listeners. But before we do that I would love to know what did you want to be when you grew up? Vickie Jeffery: I actually wanted to be an architect. Vickie Jeffery: I loved drawing plans of houses and all that kind of thing, until my dad bought a computer when I was about 10 and then things changed. Gillian Bruce: What was it about the computer that captured your interest? Vickie Jeffery: He taught me how to write in basic. Gillian Bruce: Wow, go dad. Vickie Jeffery: I wrote this little basic program. I don’t remember everything but I did but yeah it was a lot of fun from then. Gillian Bruce: … on the computer, that’s pretty awesome. Tell me about how you went from doing that to now working in the Salesforce ecosystem. Give me a little bit of your career journey. Vickie Jeffery: I started as a network admin way back about 24 years ago and moved up into IT management through that role, so I was there for 11 years. Then I moved to Australia from New Zealand. I started in another systems admin role and we had an acquisition in about 2011, and that company was using Salesforce. Since then, Salesforce has been my life and part of my work. Gillian Bruce: So it’s just a little time working at Salesforce. Gillian Bruce: Tell me a little bit about your first encountering of Salesforce, like when did you first see it, what was that like, what were you doing with it, what did you think? Vickie Jeffery: I inherited it, so the other company had put it in and I found this thing, I was like okay, what I do with this. I knew that it was a CRM and what we should be doing, but we reviewed it, all they’d really done is put some contact information in it, which I thought was quite an expensive contact card. Gillian Bruce: That’s a good analysis. Vickie Jeffery: We spent quite a bit of time looking at what we should be doing with it and used it in the acquisition to merger to companies as well. Gillian Bruce: … and then you proceeded to use it to help merge the company? Vickie Jeffery: Yeah, we did the merge … anything we found about our company outside of Salesforce, we put inside Salesforce. We handle about 120 companies around Australia, we’re an insurance broker. Everything about those companies we would put inside Salesforce, so every spreadsheet we found, every bit of information sitting on someone’s desk somewhere all went into Salesforce. Gillian Bruce: So if it wasn’t in Salesforce it didn’t exist? Vickie Jeffery: That’s the one, yes. Gillian Bruce: You have encountered Salesforce, you are now really harnessing the technology to really bring the whole business on it, tell me about how you grew your skillset. How did you start to learn Salesforce and what was that like? Vickie Jeffery: Just by using it. There was no Trailhead then, so we did have premier support I think. There was a bunch of training on there, so we went through a lot of that. Then it was finding places to go to look to other people, so a lot of hands on stuff, so a little bit different to today. Then I found the community a couple of years later and learned a whole lot since then. Gillian Bruce: I bet. I always like to say that it’s like BCAD, it’s like pre-Trailhead, post-Trailhead in Salesforce years. Vickie Jeffery: It was trial and error, it was all let’s just give this a go. Gillian Bruce: Googling and troubleshooting, yeah. Gillian Bruce: Tell me a little bit more about what you do now. Vickie Jeffery: Now my role is Business Technology Manager. I manage an IT team as well as involved in strategy and systems processes, and the like. I love strategy, so I’m really happy to be involved in that in the company. I like to have an overall big picture of the company, so it’s really about getting down and understand what everyone does and trying to streamline it, and automate, and help people with their every day jobs. Gillian Bruce: It’s very similar to a lot of the things that we hear just even new admins are charged with doing a lot of that. Gillian Bruce: What are some things and traits maybe that have helped you get that skillset and be good at that because that business analysis piece is kind of a tough nut for crack for some folks. Gillian Bruce: You’ve always been thinking this way. Vickie Jeffery: I think at my first job it was a lot around business analysis as well because I used to write out scope for databases there, so I think that might have been where it came from is just really sitting down and listening, and understanding what people are wanting and being able to translate that into a system that they could use. Gillian Bruce: Yeah, that’s kind of what we call the admin magic. Gillian Bruce: It’s taking those business problems, finding the technology, and then translating those technical solutions to help those business people to understand. Vickie Jeffery: Nowadays it’s more around architecting, so I do have staff that I’m lucky enough to work development in Edmond and I spend a lot of time in strategy and working through what we should and shouldn’t be doing, and architecting our two orgs in the community, so architecting all that. Gillian Bruce: Tell me about how you grew your career to this more of a leadership style role because a lot of admins I’m sure hear things that are very similar to the things that they do and maybe you’re like, hey, here I am, I’m admining in org and I do some of the things that Vickie just talked about. How do I up level my career to be in a more leadership role? Vickie Jeffery: I think it’s speaking up, so speaking up at your company. I made it quite clear that I was really interested in strategy and wanted to be involved, and I kept on asking, “Can I be involved? Can I be involved,” giving them ideas on what I was thinking and what could be good for the company and just continually doing that. Then I was able to attend strategy meetings as well. Gillian Bruce: I love that, voicing up and being clear about you want. If you tell people that’s what you want to do, inevitably you’re going to find somebody that gives you an opportunity. Vickie Jeffery: Yeah, that’s right. Vickie Jeffery: And continually learning, along with all the Salesforce learning I’ve continually learned about people management and business processes, and everything that I can. Gillian Bruce: That’s great, that curious mindset, always learning. Gillian Bruce: I guess that’s what happens when you start learning how to write basic when you’re 10 years old. Gillian Bruce: It sets you up on this trajectory. Gillian Bruce: Tell me about some of the qualities that you think really make an awesome admin. It’s one of those things that’s so core to us, this idea of an awesome admin. A lot of the things that you talk about that you do are things that I think about in that category, so what are some qualities that you truly think help someone be an awesome admin? Gillian Bruce: Wow, good for you. Vickie Jeffery: Well not fully, but mostly. Gillian Bruce: You at least skim them, right? Vickie Jeffery: Yeah. Just making sure that you’re aware of what the product can do and can’t do, and keep on going out and talking to other people. Gillian Bruce: You talked about talking to other people, the Salesforce community is probably a bit part of that. Gillian Bruce: You talked about how you discovered the online community early on, tell me about the in-person community. How are you involved in that, how as that helped you in your career? Vickie Jeffery: I started going to that probably around 2014. About a year leader I became co-leader of the Brisbane User Group which is not the Brisbane Edmond Group. Since then, it’s really just been meeting all sorts of people along that way. We’ve got about five groups in Brisbane and we all work together, Women in Tech, non-for-profit, marketing, et cetera, developer. Also, we now run a Down Under dreaming event in Brisbane. Gillian Bruce: I’ve heard of this. Vickie Jeffery: Bringing all of that together into one day for our people in Brisbane who may not be able to get to World Tour or Dreamforce, that’s really important to us. Gillian Bruce: What do you do for someone who’s brand new, their first ever user group meeting, they walk in and they’re kind of like, “I don’t know if I belong here. What do I do now?” As a leader, what sort of things that you [crosstalk 00:10:18]. Vickie Jeffery: You often don’t know that because Australians are not particularly out there. Gillian Bruce: I’ve noticed this, I’ve noticed this. Vickie Jeffery: We just talk to people, so you recognize the people that come all the time and the ones that you don’t we’ll just go up and talk to them and make them feel comfortable, talk to them about what they’re doing and how they’re doing it, and what we can help them with. Gillian Bruce: That’s great. Well thank you for being a great leader in the community. Gillian Bruce: It’s very important. It’s kind of the secret sauce of being in Salesforce ecosystem is that community element. Gillian Bruce: Let’s circle back a little bit, you said architecting is something that you’re focusing on now a lot. Gillian Bruce: What are some things, I think there’s a lot of things in terms of being an architect that thinking like an architect can help an admin in terms of what they’re doing with their implementation. Tell me about some of the things that you think can help an admin think more like an architect, so to speak. Vickie Jeffery: I think it’s thinking big picture and having a real understanding of the core functionality of the product. When you’re looking for solutions, talking to as many people as you can about what their after, the people that are involved, or using it, or going to be getting information out of the end, and be creative. There’s so many different ways you can do things in Salesforce that it gives you the ability to just put some creativity into it, and again, continually learn. Always learn, even when you get to that stage. Gillian Bruce: I like that. Those are great pieces of advice I think no matter what role you’re in, but especially if you’re in that Admin role and thinking about that architect piece because there’s a lot of similarities there, a lot of similarities. Vickie Jeffery: There definitely are. It’s a great segue up into being admin to being an architect. I think a lot of people are going that way now, including myself. Gillian Bruce: Well congratulations, that’s great. Vickie Jeffery: I haven’t got there yet, but yes, studying for all of the architect certifications. Gillian Bruce: There’s a lot. Are you part of the Ladies of the Architect? Vickie Jeffery: I am, yes. Yes. Gillian Bruce: We talked to Gemma on the podcast last year when we were in London for the world tour. Gemma Emmett who was one of the co-creators of the Ladies of the Architect program. We talked about it a little bit on the podcast, but give us one or two lines about Ladies of the Architect. Gillian Bruce: That’s got to be a really hard crossover time wise, right? Vickie Jeffery: There’s one tonight which is Community Cloud which I really wanted to go to, but I think I’ve got to get up at two o’clock or something to do that. But at Dreamforce I went and met them all and it was just really good to be able to meet a whole bunch of different ladies, and guys were there too, to talk about the possibilities and where everyone was at, and the fear that sometimes you get about doing down that track and whether you’re an imposter or not. That’s great, as well as the sheer knowledge that Gemma and everyone has and she is. Gillian Bruce: That’s excellent. Well congratulations on your journey. Gillian Bruce: I know it’s an awesome one. Just knowing about some of the content that you go through in that process is amazing and I’m sure that it will invariably help you as you move forward as well. It’s a great crew of people. We’ll definitely make sure to put a link in the show notes about Ladies of the Architects so people can check it out. Gillian Bruce: Well I want to thank you so much for joining us Vickie, but before I let you, you’re not going out of this without answering a lightening round question. Gillian Bruce: We’re doing a down under version of the lightening round question. Gillian Bruce: Since you are in Brisbane, which is a little bit outside of Sydney, up North, what is one thing that someone visiting Brisbane for the first time should do? Vickie Jeffery: Catch the ferry. There’s a free ferry that goes up and down the river and it gives you a beautiful view of the city. Gillian Bruce: Love it. I love boat trips, so that’s good. I’m adding that to my list. I’m like, “Hmm, when I go to Brisbane.” That’s great. Vickie Jeffery: You could visit the Gold Coast too, but Brisbane’s better. Gillian Bruce: Is that a jumping off point for the Great Barrier Reef or is that further North? Vickie Jeffery: … that’s further north, yeah. Gillian Bruce: See, I’m learning about Australia geography as we are on the podcast, that’s great. Gillian Bruce: Well Vickie, thank you so much for everything that you’re doing and congratulations on your amazing career trajectory and growth, excited to see where it goes next. Gillian Bruce: Really appreciate you taking the time to be with me and be on the podcast. Vickie Jeffery: Thank you very much. Gillian Bruce: Huge thanks to Vickie for taking the time to sit down and chat with me in person in Sydney, Australia, it was really fun to get to know her a little bit. Gillian Bruce: I wanted to recap a couple of the things that I really liked learning from our conversation and the first one is, oh my goodness, her dad taught her basic at 10 years old. That’s incredible and that really set her off on a journey in a career that is very technical, so very cool to get that exposure early on. Her journey from being a network admin, systems admin, and then inheriting Salesforce, having to learn it on the job, I think is a really inspiring story because I think a lot of us have fell into Salesforce in some way or another. She was immediately enthralled with the platform, said, “Hey, it can do so much more than just story context.” It’s a great overpriced Rolodex, so to speak. She learned about the platform herself, this is before the days of Trailhead, so it was a lot of hand’s on trial and error and she actually is able to use Salesforce to merge all of the different parts of the company that she was working on when their company got acquired and she inherited Salesforce, so very great, cool, hand’s on experience. Gillian Bruce: Now she manages an IT team and she’s focused really on strategy, doing a lot of architect type work and the way that she got there was really making it clear that’s what she wanted to do. Now, we’ve talked about this in a few episodes on the podcast in the past about how you have to make what you want very clear. Make your intention very clear with your managers, with your stakeholders, with the people that you work with. Tell them what you want to do because the more that you explain that, the more that you put that out there, the higher likelihood you are going to get the opportunity to do so, which is what happened for Vickie. Gillian Bruce: Now, one of things that I thought was really helpful that Vickie shared with us about what being an awesome admin means. First, it’s good communication and analytical skills. Next, it’s looking at requirements and being able to translate them back into the system. Finally, continuously learning new things. She talked about that a lot and I have heard it in many other guests in terms of what they think makes them successful, so continuously learn. Gillian Bruce: On that note, we’ve got some great content on Trailhead to help you continuously learn about how you can help grow your career. Now, there’s a career development planning module on Trailhead I highly recommend, it helps you map out where you want to go and think about how to get there. But there’s a brand new project that I definitely want you all to check out and this is awesome. This is a project actually built by the Trailhead team just in the last few weeks, it’s amazing, and it’s called Build an App to Track your Trailblazer Journey. Now this is so cool because you’re actually building an app step-by-step that you can use in real life to track your progress on your career journey with Salesforce or with not Salesforce, but you can put in your discoveries that you learn about different opportunities in there. You can customize it. I saw somebody on Twitter actually put some mobile notifications in there. You can do a lot with this core app that you build in the project, so definitely go check it out. It’s a great tool, it’s a great way to learn. Gillian Bruce: If you want to learn more about Ladies of the Architects I got the link there in the show notes. If you want to hear a little bit more, we did have Gemma Abbott on the podcast last year to talk more about Ladies of the Architects and I put that link in the show notes as well. Gillian Bruce: Please remember to subscribe to the podcast and make sure that you get the latest and greatest episodes delivered directly to your platform or devices of choice the moment they are released and share with your friends. Also, give me some feedback. I love seeing feedback on Twitter. You can ping me in the Trailblazer community, any way you want to share feedback, thoughts, interesting insights that you’ve got, please share away. I really love seeing the impact of the podcast and learning about what you want to learn on the podcast as well. Gillian Bruce: You can also find out more about being an awesome admin at admin.salesforce.com where you can find blogs, webinars, events and yes, even more podcasts. Gillian Bruce: Thank you so much for listening to this episode today. You can find us on Twitter @salesforceadmns, no “I”. Our guest today, Vickie is on Twitter, @VickieJeffery. That’s V-I-C-K-I-E J-E-F-F-E-R-Y. You can find myself @gilliankbruce. Gillian Bruce: Thank you so much for listening to this episode and we’ll catch you next time in the cloud.